The DGFG provides patients throughout Germany with corneas, amniotic membranes, heart valves and blood vessels. Each year we save thousands of patients‘ eyesight, and sometimes even their lives. We’re the single largest tissue network in Germany. We organize tissue donations in hospitals. We allocate tissue preparations for transplants. We cooperate with tissue banks. We help to support the research and development of new methods. Every year doctors transplant much more tissue than organs. Tissue comes mainly from postmortem donors. Nothing happens without clear organization, careful planning and insightful conversations. 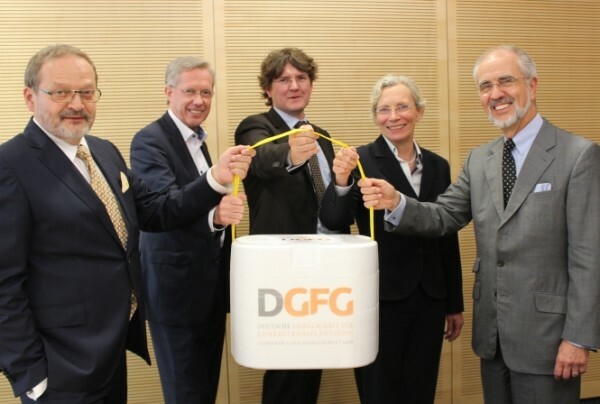 The DGFG supports tissue donations in the hospitals. We work to build donation programs and coordinate the tissue donation in the cases of organ donors. Our experts are on site in twenty facilities. Doctors do not transplant tissue immediately. The DGFG operates two tissue banks and operates in conjunction with others from all over Germany. Our employees have many years of experience in the organization and operation of tissue banks. Valuable tissue is not lost. Doctors need only to contact one allocation office, when a tissue preparation is required. In this regard, we maintain regional traditions. Tissue transplantation clinicians today have previously unimagined possibilities for treatment. Because of this, they need to be sure of their plans and the reliability of the service. Therefore the DGFG creates the necessary structures to be sure the doctors can focus on their patients. Our employees make certain of the quality and the security of tissue donations. We take care of the testing and transport. The cooperation in the tissue network is both individual and multifarious. We cooperate with our partners for the tissue donation, the tissue processing in the tissue banks and in the allocation of tissues for transplant. New partners are always welcome. We look forward to contact from you.